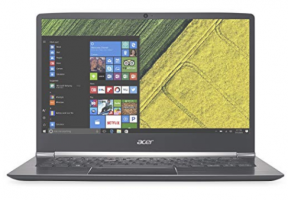 Acer Swift 5 SF514-51-706K NoteBook Laptop comes with Windows 10 Home 64-bit Operating System, 7th Generation Intel Core i7-7500U Dual Core processor ticking at 2.7GHz with Turbo Boost Technology up to 3.5GHz (4MB L3 cache) clock rate, 8GB DDR4 Memory and 256GB PCIe NVMe Serial ATA/600 SSD Solid State drive internal storage. Acer Swift 5 SF514-51-706K NoteBook Laptop also has DTS Sound,Integrated stereo speakers, Acer True Vision web cam, Microphone, Full-size backlit island-style keyboard. The Laptop has 14.0 inch screen size, Height 0.6 x Width 13.0 x Depth 9.0 inches Physical Dimension and 2.14 lbs Weight and 3-cell Lithium Ion (Li-Ion) 54Wh 4670 mAh Battery.